As We Three prepares to launch their album, Celebrate the Struggle, Part 1, the siblings have found a non-profit partner to work with. In this interview, learn about their history, the upcoming release show on December 10, and their plans for the next year. 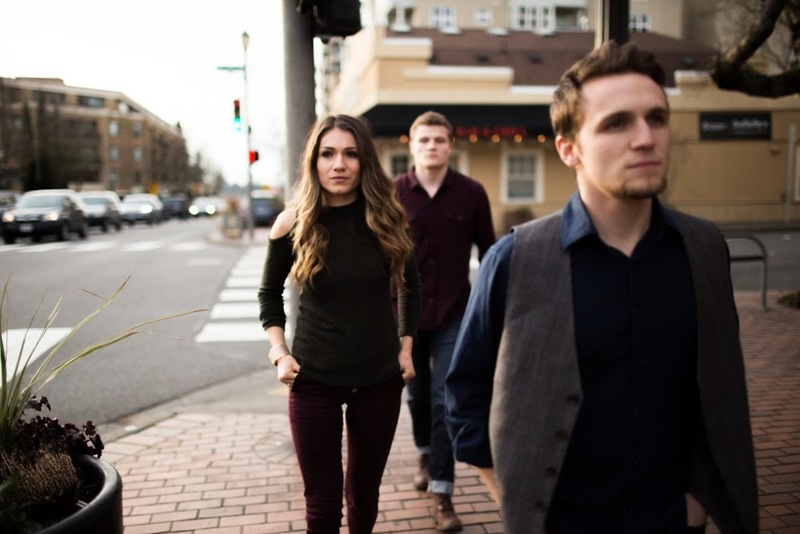 Siblings who have been playing together for a while, We Three create original music, as well as bringing their own style to some of your favorite covers, past and present. Check out the interview below, and be sure and mark your calendar for a fun and worthwhile event. PORTLAND NOTES: Tell me about the upcoming release – how did you decide when to “drop”? How will you promote the new music? What’s it called? WE THREE: As for the release date we basically chose it because we it worked out well for the December 10th concert . We were asked to partner with an organization called Hope On The Hill by putting on a benefit concert for them on the 10th at their Church on the Hill. In doing so we wanted to take advantage of our amazing community of people who would be coming out by releasing our album specifically for that concert. We have an amazing support system in our town. The community of McMinnville loves the arts and LOVES supporting local musicians. We have fans who have seen our shows too many times to count but still make it a priority to come out to every show they can. It means so much to us. The album is Called “Celebrate The Struggle Part 1”. We’re releasing this album in three parts because we are so eager to release a full album again. In our society we are all about instant gratification and we completely understand that’s it’s important to continue releasing projects for your fans. We didn’t want to keep our amazing group of fans waiting for a whole album which can take a while so we decided to split it up into 3 parts. By doing so we’ll still get to release Part 3 as the final album with all the parts combined. For us it’s going to feel like a completed project because we have so many songs we want to share! 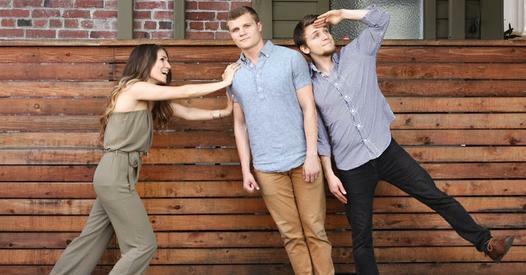 PORTLAND NOTES: How did You Three find each other? WE THREE: We are siblings, so we met at birth. We started playing together almost 10 years ago. We grew up each taking private lessons all starting on piano and from there shifting to our main instruments. Joshua stuck with piano and added drums. Bethany shifted to bass. Manny shifted to guitar. All of us love singing as well. We learned to sing and play simultaneously. PORTLAND NOTES: Who are your musical idols, past or present? PORTLAND NOTES: What is the first band you remember hearing as a child? Who played that album for/with you? WE THREE: Earth Wind and Fire by dad. PORTLAND NOTES: Why do you all make music – what message do you want as your legacy? WE THREE: It’s our way to connect with people, spread light and love and spread the vision of hope for a better tomorrow. We like to be honest in our songs. As songwriters we’re learning how important and difficult it is to be honest and vulnerable through your music because that’s when you can touch the most people. We hope to encourage and support people right where they’re at in their lives through our music. PORTLAND NOTES: What are your plans for 2018? What are you looking forward to most in the coming year? WE THREE: We are looking forward to promoting this album and finishing up part 2 and 3! We’ve had some exciting opportunities and some incredible feedback on the album already, which makes us very excited about this coming year! Our summer concert schedule is already filling up! We’ve learned so much and love the idea of life being all about the journey! We don’t expect to ever get to our destination. We love the journey and pushing ourselves to constantly grow in our music. We’re grateful that we get to do it together as siblings. 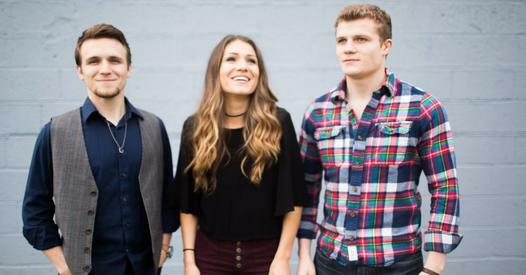 You may listen to music by We Three on their website, and engage with them through Facebook, Twitter and Instagram. 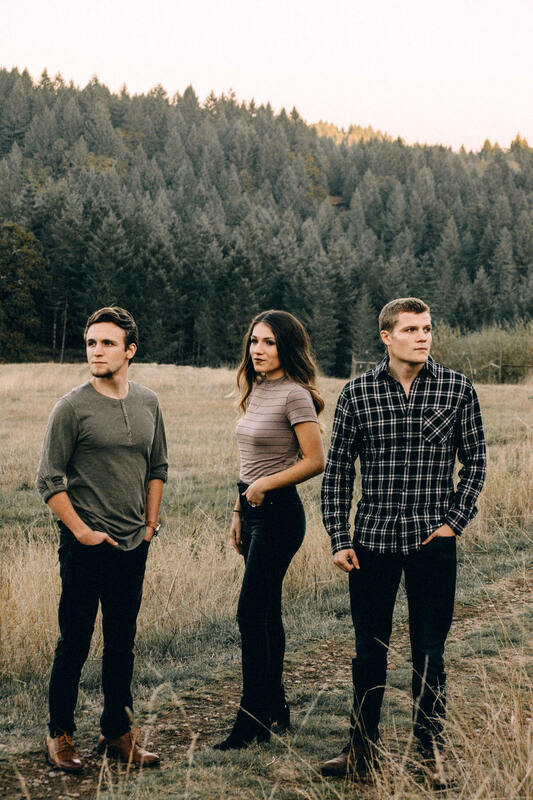 We Three consists of siblings (two brothers and a sister) from McMinnville who say they live in the moment, and their music tells their story. They are pictured above in chronological order. This is important information should you catch a live show as they often give prizes to people who can guess. (I expect a cut if you win.) Joshua Humlie is the oldest who plays percussion, including keyboards. Bethany Blanchard is in the middle playing a 5-string bass. Manuel Humlie is the youngest on the guitar. They all sing and participate in the on-stage chatter throughout the show. There is something special about watching siblings work. Since they obviously know each other very well, all the pieces just fit. Being a geek, I couldn’t help but notice how well they use technology. Little things like employing in-ear (instead of on-stage) monitors so the mix is consistent throughout the room. Even though McMenamins Grand Lodge provides a sound system, this band opted to use their own, making for a great deal more work. In the video clip, We Three performs their song Timeless. Manuel introduces us to his friend, Larry the loop. If you don’t know what a loop is, you’re about to find out!